All energy moves in a cyclical sequence from 0-9 and thus ten Steps. These Steps provide the stasis or balance to all movement and process. It is the key to the structure of the universe and to how this universe defines itself. Within the process of our life experience we go through Seven Steps at each movement. The eighth step establishes the new pattern, the ninth step moves it and then the tenth step signals a completion of one cycle and the beginning of the next stream of life. These Steps match the Seven Dimensions of this universe through which light becomes life and gives life. The Seven Steps describe how energy moves through life in a constant and continuous cycle. The Seven Dimensions refer to the seven levels of existence and the potential levels of awareness of that existence. Join us tomorrow for a description of the 10 steps! Pay It Forward – A Nia Jam! Razel gets her groove on! Today the Rainbow Power Center was jamming with music, dancing, laughter, health, and abundance as 22 women gathered to dance in support of the recovery of those with spinal cord injuries. The event raised hundreds of dollars for The Lone Star Paralysis Foundation and was sponsored by Arizona Nia Teachers (including Razel Wolf who is also a SMSD teacher) and AZNiaNow. A portion of these funds will benefit Daniel Curtis, the son of a Nia Trainer, who sustained a spinal cord injury in May of 2011. Flexibility, agility, mobility, strength, and stability. Joy, laughter, and the power of individual expression. Aerobics, stretching, coordination, technique, beauty. 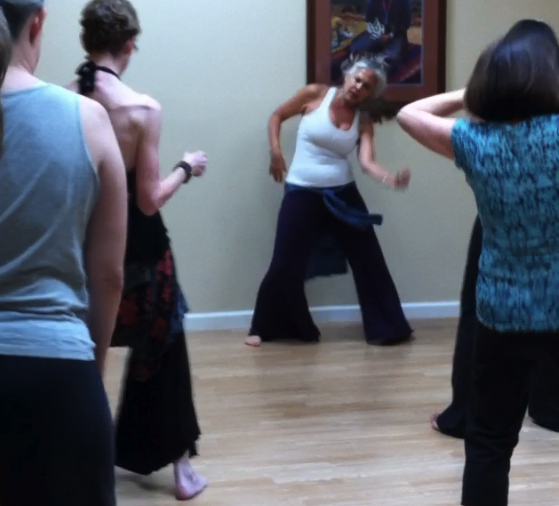 Nia includes it all, and teachers and classes can be found worldwide. We were blessed to have such power and giveaway fill our space today, calling us all into the dance!